2017-18 Panini Spectra Joel Embiid "Vested Veterans" Patch Green #6/25 76ers. Condition is Like New. Shipped with USPS First Class Package. Game worn material!! Nice looking card! 2018-19 Panini Select Basketball Landry Shamet RC Gold Prizm Courtside 1/10 SSP. Condition is Like New. Shipped with USPS First Class Package. S et Type: 2018-19 Cornerstones - Quad Relic & Autograph. Car d #: CS-JJR. Card Type: Red Wave Prizms Parallel SP /350. Player: Allen Iverson. Product: Prizm Basketball. Manufacturer: Panini. 2018-19 Cornerstones J.J. Redick Quad Relic Auto /49. Condition is Brand New. Shipped with USPS First Class Package. 2010-11 Rookies & Stars EVAN TURNER Dress For Success AUTHENTIC AUTOGRAPHED Rookie Worn Used JERSEY AUTO RC! Ohio State Buckeyes, Philadelphia 76ers, now with the Portland Trail Blazers. Super SHARP & BEAUTIFUL Signature! YOU ARE PURCHASING THE BOX IN THE TITLE. SEE SCAN FOR CONDITION. 2018-19 Panini Dominion LANDRY SHAMET 40/49 MAIN EXIBIT ROOKIE AUTO 76ers. Condition is Like New. Shipped with USPS First Class Package. Up for sale a 2018-19 Court Kings Heir Apparent Autograph card of Zhaire Smith. The card is serial # 167/199. 2018-19 Court Kings Zhaire Smith Fresh Paint Ruby rookie auto #79/99. 2018-19 Donruss Optic Ben Simmons Pink Prizm Ssp 6/25 Card #59 76ers. Condition is Like New. Shipped with USPS First Class Package. 2018-19 Cornerstones J.J. Redick Quad 2Clr Relic Auto Crystal #34/49 - 76ers. Condition is Brand New. Shipped with USPS First Class Package. 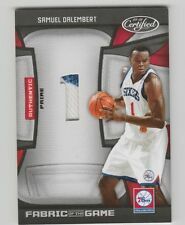 18-19 Panini Select Swatches Jimmy Butler /49 Philadelphia 76ers. Condition is Brand New. Shipped with USPS First Class Package and Worldwide! This card is one of Embiid's best rookie cards and is serial numbered to 21. The card is nm-mt or better. 2018 19 Court Kings JJ REDICK Sovereign Auto Autograph /49 #01/49. Condition is Very Good. Shipped with USPS First Class Package. Markelle Fultz Gala #'d 1/8 base RC. Not a parallel, only 8 made. Almost impossible to hit, and this is the first off the line! He is now on the Magic, grab him before he gets his mojo back! Pictures are high resolution, look at card before purchasing. Amir Johnson. 2013-14 Spectra. Autograph Card. Serial #19/175 (back). Serial #4/108 (front). Ben Simmons 2017-18 Chronicles GOLD /10 SSP Parallel #67. (Read Below). Landry Shamet 2018-19 RC Panini Select Prizm White # 041/149. Condition is Brand New. Shipped with USPS First Class Package. A GREAT ADDITION TO ANY SPORTS COLLECTION. CARD PICTURED IS THE CARD YOU WILL RECEIVE. 2018-19 Certified Green The Mighty Joel Embiid Philadelphia 76ers 2/5. Condition is Brand New. Shipped with USPS First Class Package. (1) 2018-19 DONRUSS OPTIC "RED PRIZM REFRACTOR" ROOKIE CARD OF ZHAIRE SMITH... CARD NUMBER IS 154 AND SHORTPRINT NUMBERED 53/99!!! Shipping is $3.66 to $4.06 depending on where you live in the USA and THATS FOR AS MANY AUCTIONS AS YOU WIN!! ... so it is $3.66 -- $4.06 if you win 1 or if you win 100 auctions... All cards will be shipped in a toploader and mailed in a bubble wrap package... please pay as soon as possible!! Also any scratches or smudges or spots are on the card protectors not the card unless told... and if the picture shows a card in a magnetic case or screw down case it will be shipped in that case!! Feel free to message me if you have any questions at all...thank you and good luck!!! BEN SIMMONS 5-card lot-including B.Simmons/J.Embiid sp /2000 PHILADELPHIA 76'ers. Condition is Like New. Shipped with USPS First Class Package. This is card #FP-ZSM in the set. They made 25 of these cards and this is card #10/25. We only accept Credit Cards from the United States. 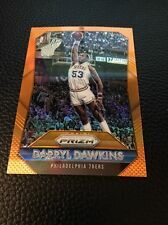 2018 Panini Donruss Optic Charles Barkley Retro Series Blue Holo Prizm 23/49. Condition is Brand New. Shipped with USPS First Class Package. 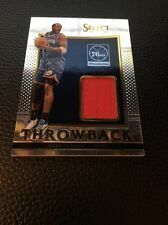 2018-19 SELECT LANDRY SHAMET ROOKIE BLUE DIE-CUT PRIZM 76ERS #63/249 76ers RC. Shipped with USPS First Class Package. 2018/19 Panini Select Basketball Landry Shamet Green Prizm 20/75!! RC! SP! 2018-19 Panini Cornerstones Allen Iverson Quad Patch Autograph serial #08/10. 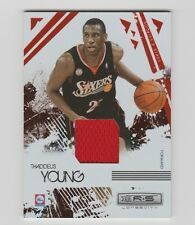 A must have for any 76ers fan. 2018-19 Panini Prizm Fast Break Allen Iverson BLUE Disco Prizm #/175!